I’m not crafty but my 11-year-old is, and that’s how we ended up with a gig preparing demo models of Arma Dei’s Catholic craft kits for our local Catholic bookstore. I’d seen these before but never used them. Putting a set together has let me see how much catechesis these kits offer, and how well they’d work with any religious ed curriculum. 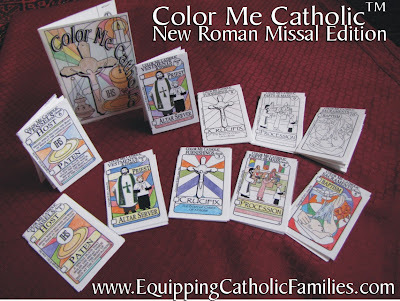 The two sets we’ve been working with are Color Me Catholic and the Journey with Jesus kits. The first is great for first-communion age — nice easy coloring crafts that teach the basics of Catholic vocabulary. The second set lines up perfectly with the study of the sacraments that was the mainstay of our parish’s 5th grade class, and the activity pages are substantial — so much so that we didn’t have time to look up all the answers, and had to put together a demo using just the easiest pages. The craft itself — putting together an accordian-style booklet– is a little complicated. We simplified by using staples rather than glue, and there’s a scrapbook-style option as well. The Journey with Jesus set would be appropriate for students from about 5th – 8th grade. The Arma Dei kits are reproducibles, and the copyright gives you permission to make copies for either one class or one family. The pricing is in line with that: One appropriately-chosen kit is enough to keep your class busy for a full year. 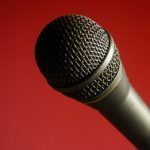 Not all students are wild about crafts, so I’d recommend offering an alternative learning activity, and letting students pick whether they want to be in the craft group or the game group. A recent find that I really like is Cactus Game’s Inklings board game. The game is designed to be friendly towards those of us who don’t know our Bible as well as we ought, but let’s be honest: Some of your students aren’t going to have the slightest clue about some of the questions. I’d recommend first playing the game by just using the quiz questions to let members of the game-group learn and test each other. Then play for points after students have been introduced to all, or most of, the cards. 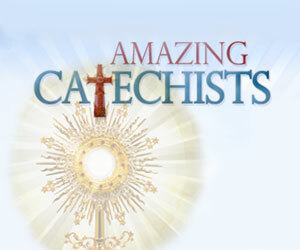 You the catechist may want to flip through the question cards and do some previewing — some questions are more obscure than others — and decide which cards need previewing, and which students will be able to guess without help. Thanks for your review of our Cathletics Craft Kits! I didn’t realize your connection with St Francis Shop! I saw a picture of their display (and all your work and your daughter’s!) and I think I may need to create a similar display for some of our own upcoming events. Incidentally, the more ‘substantial’ pages of the craft kits which have questions and prompts based on the Catechism…should have the answers in the cut-away margin with the extra clipart! Thanks for your review and the links!